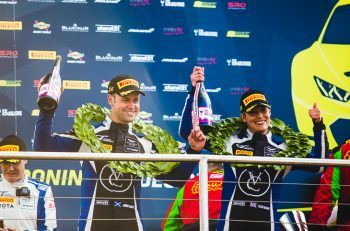 Optimum Motorsport Aston Martin crew Flick Haigh and Jonny Adam took their second win of the British GT season and the lead of the championship on Sunday, triumphing in the two-hour race held in glorious sunshine around the Brands Hatch Grand Prix circuit. In GT4, it was Graham Johnson and Mike Robinson in the Balfe Motorsport McLaren that finished first, winning both the Pro-Am and overall categaories. Following a clean opening couple of corners, Haigh streaked away to a healthly lead at a rate of about half a second a lap, second and third-placed Andrew Howard (Beechdean Aston) and Graham Davidson (Jetstream Aston) kept each other busy, further helping the Optimum car get away. Barwell Lamborghini duo Jon Minshaw and Sam de Haan held station in fourth and fifth, ahead of Rick Parfitt in the #1 Team Parker Bentley and Lee Mowle aboard the ERC Mercedes. The leaders started to meet GT4 traffic around lap nine, at which point Haigh’s lead over Howard was in excess of five seconds. Pariftt began exerting pressure on de Haan for fifth as they filtered through traffic. 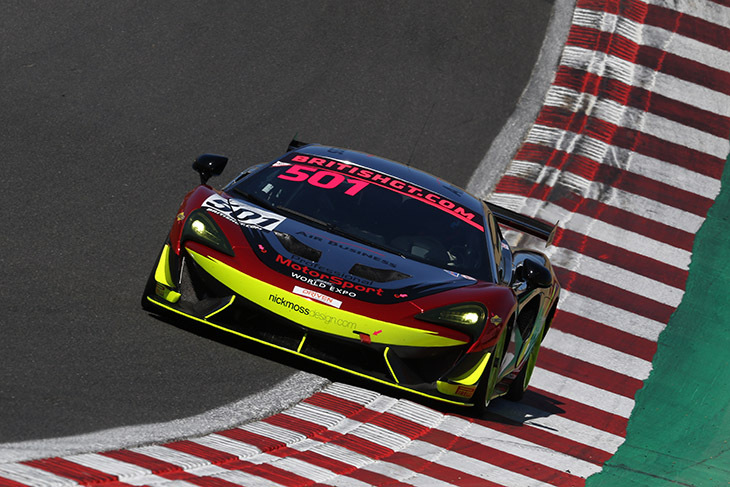 Minshaw then dropped back into de Haan’s sights after having to avoid a spinning GT4 McLaren, making it a three-car train battling for fourth. Haigh had stretched the lead to 10 seconds by the end of lap 15, with little separating Howard and Davidson in second and third still. Pariftt had by now got ahead of de Haan to move the #1 Bentley into fifth. The safety car was deployed on lap 19 due to a GT4 Ginetta stranded in the gravel at Sheene Curve, wiping out Haigh’s hard-won lead and bunching up the rest of the field. Davidson took second from Howard on the restart, taking advantage of a lapped GT4 Mercedes in the safety-car queue. A huge GT4 crash on the pit straight then brought the safety-car out again almost immediately. The field were sent through the pitlane while marshals rebuilt the tyre wall and cleared up the debris; green-flag racing resumed with an hour and six minutes on the clock, just ahead of the pit window opening. Haigh, Davidson, Howard, Minshaw, Parfitt, de Haan, Mowle and TF Sport Aston Martin driver Mark Farmer were the top eight runners on the restart. Farmer got ahead of Mowle for seventh just ahead of the stops, with Mowle then finding himself fending off the attentions of Ian Loggie in the #7 Bentley, who got ahead briefly before the Mercedes repassed. All of the GT3 runners save Parfitt, de Haan and Johnston pitted as soon as the window opened, with Haigh in the #75 (+10 seconds), Davidson in the #47 (+20 seconds) and Parfitt in the #1 (+15 seconds) all having to spend longer in the pits due to their Spa results. De Haan dived in a lap later, Johnston waited for a further lap before coming in and Parfitt staying out even longer. De Haan’s co-driver Johnny Cocker emerged in the effective lead of the race ahead of Adam, Darren Turner, Phil Keen, Nicki Thiim, Yelmer Buurman, Marco Sorensen, Callum MacLeod and Maxime Martin. Ryan Ratcliffe, having taken over the #1 Bentley from Parfitt, got wide on the grass while lapping a GT4 car at Stirlings, beaching the Continental in the gravel. The car rejoined having been recovered, but it was a long way off the back of the field and later retired due to brake damage from the gravel. Third to seventh were now running in a train with 45 minutes of the race to go, while Adam was right on the tail of leader Cocker at the same time. Martin meanwhile brought the Jetstream Aston into the pits with a large hole in the windscreen, seemingly resulting from encountering debris. There was also drama for erstwhile championship leader Keen, with the #33 Barwell Lamborghini slowing and pitting on lap 58 due to a radiator blocked by debris, promoting Thiim, Buurman and Sorensen to fourth, fifth and sixth respectively. With just over five minutes to go, the battle between Aston works drivers Thiim and Turner was resolved in favour of Thiim, the Dane snatching third in the #11 TF Sport car through Paddock Hill Bend. 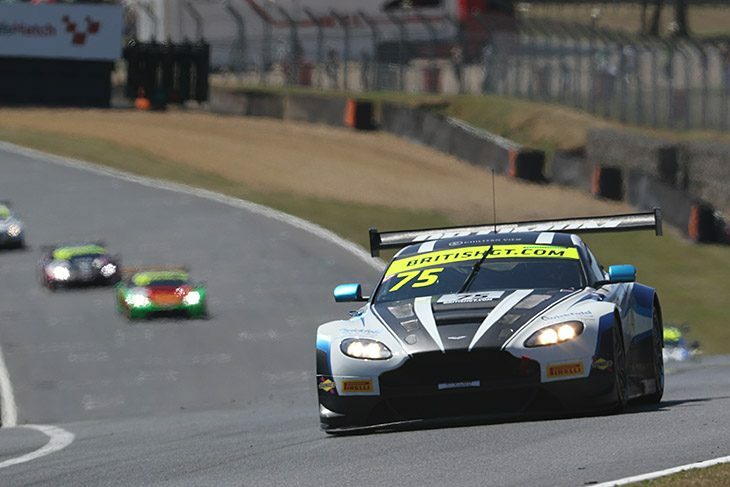 Around the same time, Adam’s relentless pressure on Cocker up front finally paid off as the Optimum Aston moved into the lead between Westfield and Dingle Dell with under five minutes on the clock, leaving the order Adam from Cocker, Thiim, Turner, Buurman, Sorensen and Macleod at the flag – only seven of the 10 starting GT3 runners making the finish. The first half of the race was rendered largely an irrelevance because of two safety-car periods, the last of which ended only six minutes before the opening of the pit window, leading to a bunching-up effect and hitting those three cars with the additional pitstops particularly hard. The second safety car was brought out after a big accident on the start-finish straight involving the #44 Jaguar of Paul Vice, which escaped, and the #50 HHC Ginetta of Will Burns, which most definitely did not, after hitting, and going through, the tyre wall to driver’s left. Given the additional pitstop time penalties to be served by #43, #4 and #10, the running order was totally reshuffled during the driver-change pitstops and served up a Balfe #501 lead over the #53 Nissan and the #66 Mercedes. That’s how it looked like they would finish until the final minutes of the race, and indeed the #501 Balfe McLaren managed to take the win despite both Graham Johnson and Mike Robinson complaining of a cockpit issue which made the car hard to driver. Scott Malvern in the #66 had tried for 20 minutes to pass Plowman in the Nissan, but eventually Ben Green chased them both down, passing Malvern on the penultimate lap with unmatched speed down Hawthorn Hill and just out-dragging Plowman in the run to the chequered flag. Less than two-tenths of a second covered second to fourth. 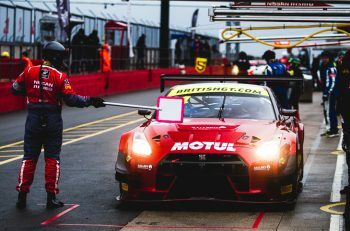 After the race a red-faced and still clearly buzzing Ben Green confirmed that he “half didn’t think I was going to catch them before the end of the race but then I realised that because they [the Nissan and Mercedes] were battling I could do it. Once I caught them to be honest I got lucky with a backmarker, the Jaguar was over to the right so I feinted one way and then got the Mercedes with a good run. It was a strong finish in the end for the #42 BMW, winning the Silver category too, having led the entire first half of the race convincingly from the sister #41 car. That #41 car had a fairly uneventful second half of the race and Jack Mitchell finished seventh, a place behind his championship rivals in the #55 HHC Ginetta. Joe Osborne was fifth, a great result seeing as his #56 Tolman McLaren started from the back of the grid, after the team had worked until 5am this morning doing an engine change. O’Brien brought the other #4 McLaren home eighth, behind the #86 Toyota GT86. This was still a good result for Steller despite being tapped into a spin and also serving a stop-go penalty for a short pitstop. The car had the pace of the best in the class for most of the race and has certainly made a leap forward. Charlie Fagg had ran third for much of his stint in the car, having passed the #61 Aston Martin halfway round the opening lap as planned. The #5 Tolman McLaren was an early retirement with collision damage, while the #10 fell away with a puncture and the Academy Aston Martins were both strong initially but fell out of contention with problems later. A satisfied Graham Johnson felt the result was “finally what we deserved. We’ve had far too much contact this year, people seem to really like the look of the rear of our car and want to touch it! “On the green flag lap it sounded like there was a box of tools or something in the footwell and I was on the radio asking what it was but it stopped as soon as the race started. The car was understeering a lot though and the behaviour was changing through my stint. It sounded like the car was hitting the ground and it got worse and worse as the stint went on, it was very difficult to drive but I had to get my head around it.